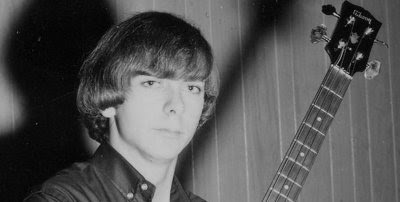 Bill Flores, the bass player for the Chocolate Watchband, died on Thursday (March 8) . Flores was born in the east but moved to Santa Cruz in 1960, playing with the surf band the Shandels where, in 1965, he met Mark Loomis who had just finished in an early version of the Chocolate Watchband. The two hit it off and decided to resurrect the Watchband name in a new band that would pattern themselves after the most rocking of the British Invasion groups. The group burned bright in the South Bay and San Francisco areas in 1966 and early 1967, initially releasing three singles on Uptown Records before their debut album, No Way Out, was released on the parent Tower Records. The album was an early example of what would eventually be called Protopunk, mixing garage band sounds with psychedelia. The LP did not sell well but has gone on to be admired by rock historians and fans. Loomis left the band in the middle of 1967 and the second version of the Watchband broke up shortly after No Way Out was released. Flores reformed the group for a short time to fulfill contractual obligations but they fully disbanded before the end of the year. Another version of the band formed in late 1968, with original vocalist Danny Phay helming, to record their second album, The Inner Mystique; however, disputes within the band led to the label using studio musicians in place of band members for over half of the tracks. A third album, One Step Beyond, was released in 1969 but, before the end of the year, Flores had gone his own way ending up in a band called Muscrat Fun along with a number of other groups around southern California. In 1999, the Chocolate Watchband reunited releasing two albums, Get Away (2000) and At the Live-In Live! (2001). Flores left the band for the last time in 2001. A fine tribute to Flores by Alae Palao is currently up at Ace Records.